I have never been a big fan of beets. I love their bright purple hue but find them a little too sweet and slimy on their own. However, since so many people love them, I figured it was time I jump on the beet bandwagon. I asked my Facebook friends for their best beet recipes, and several suggested some version of beets with goat cheese: served together as a side dish, tossed with greens and vinaigrette as a salad, and even beet ravioli filled with goat cheese. After trying the combo, I was instantly hooked. 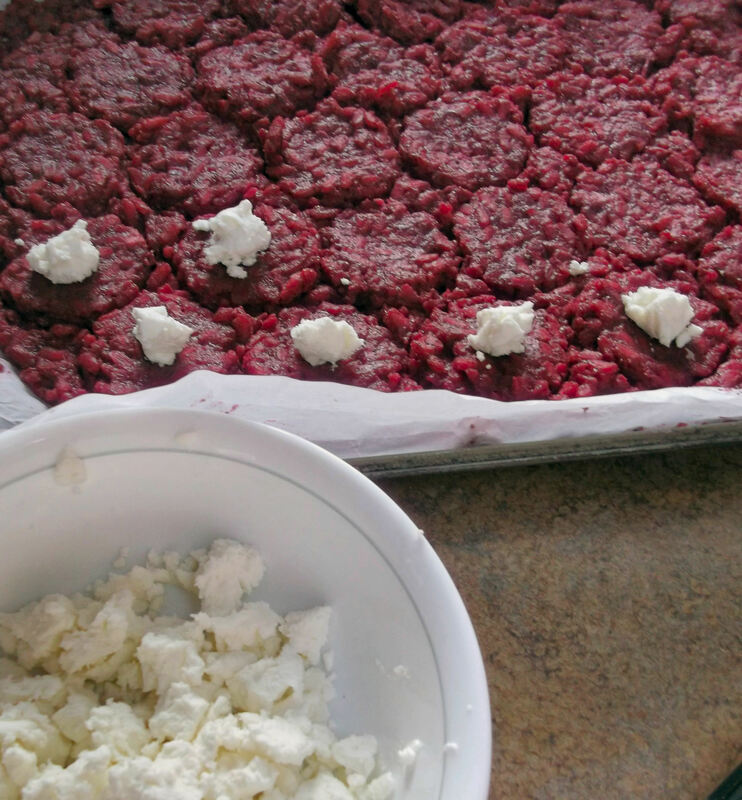 The sweet and earthy flavor of the beets contrasted perfectly with the sharp tang of the goat cheese. I started thinking of other ways to pair the two flavors. 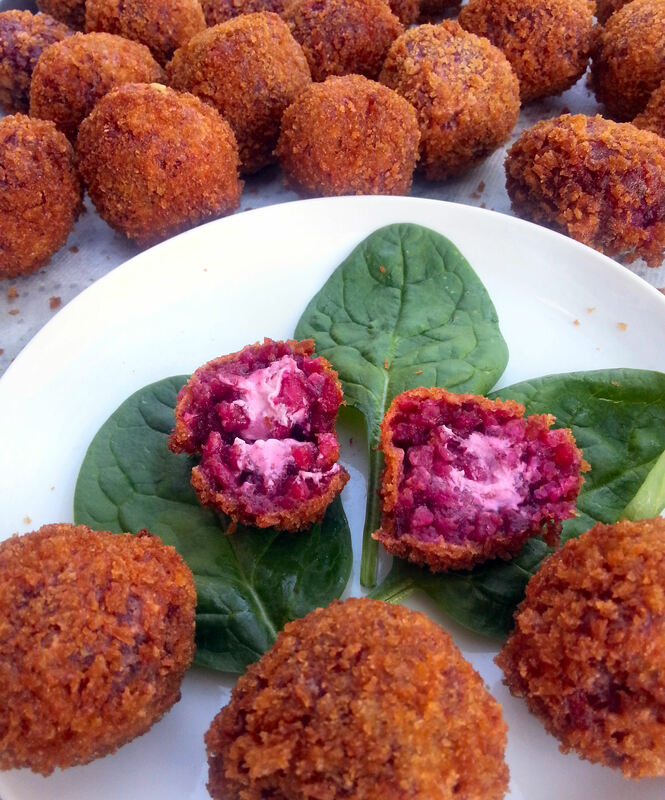 Since I already had beet risotto on my Things to Try with Beets list, I was suddenly struck by inspiration: arancini! Bite-sized snacks hailing from Sicily, arancini (air-an-CHEE-nee) are stuffed balls of risotto, breaded and deep fried. I have tried several versions of arancini over the years, so I had a pretty good idea how I would go about making mine. Just before I started, I figured I should check online to see if these had been made before. Why reinvent the wheel, right? I was happy to find this recipe, which was pretty much exactly how I was planning to make them. So one lazy Sunday when blustery autumn winds kept me indoors, I consulted both recipes and set to work. 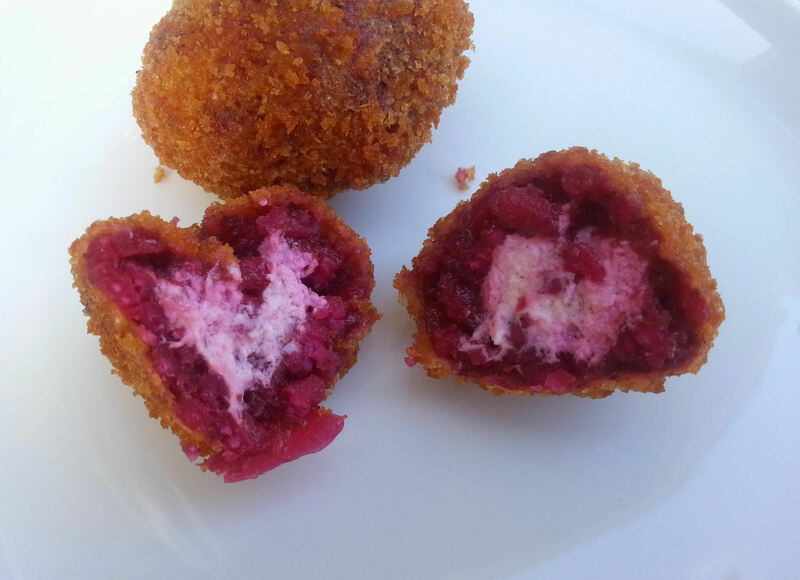 The moment I bit into the first crisp ball, fresh from the fryer and oozing with pink-tinged goat cheese, I was hooked. Again. I think I might love beets after all. Keep in mind that making these from start to finish will take quite a bit of time, so feel free to work in stages and refrigerate things along the way to continue later. I’m listing the ingredients here, but to make the risotto, just follow my beet risotto recipe here). Follow my tips for an easy way to roast and peel beets. 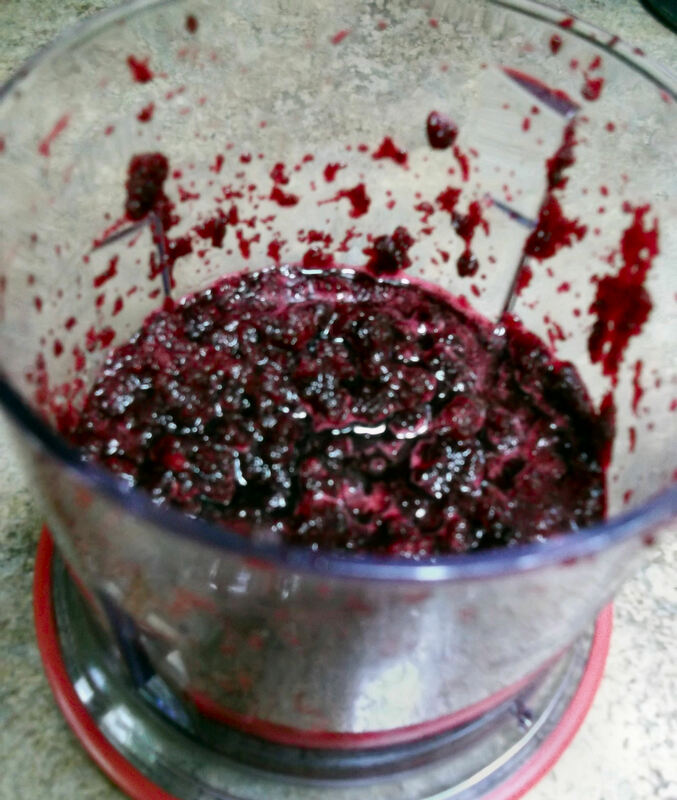 Cut the roasted beet into eighths and place in a food processor or blender. 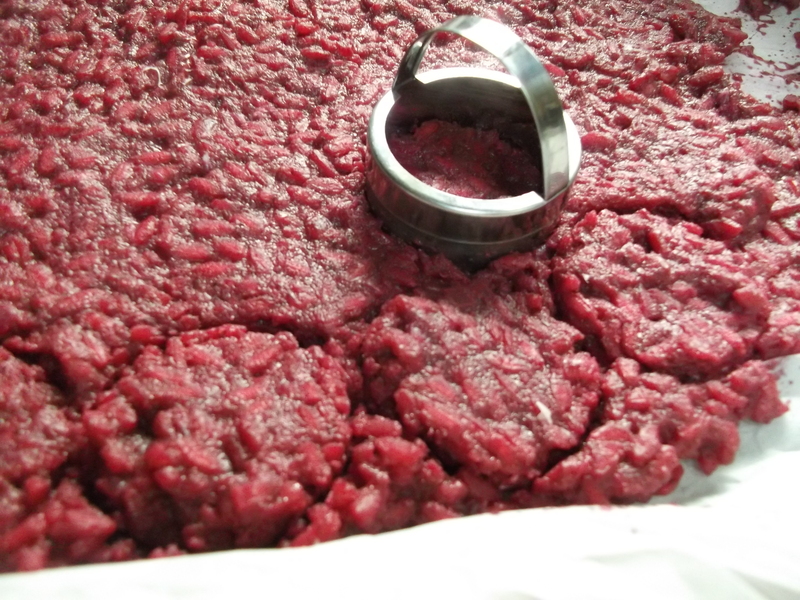 Puree until smooth, scraping the sides often and adding up to ¼ C water to maintain a smooth consistency. Set aside or refrigerate until later. For the risotto: Follow my beet risotto recipe here. 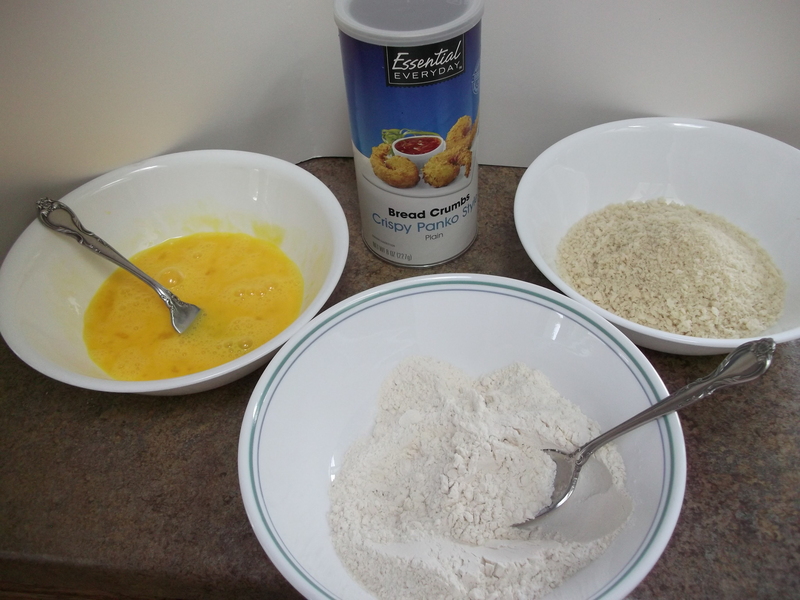 Place the flour, eggs and panko each in a separate bowl. Using a 2” cookie cutter (or something else small and round), cut the cooled risotto into evenly shaped rounds. Leave them in place on the parchment and press a marble-sized (½” to ¾”) piece of goat cheese in the middle of each round. Using a spatula, carefully lift up a piece and place it in the palm of one hand. Curl that hand slightly to form a bowl and use the other hand to shape the risotto into a ball, completely enclosing the cheese. Wet hands with water if the risotto starts to stick to them. 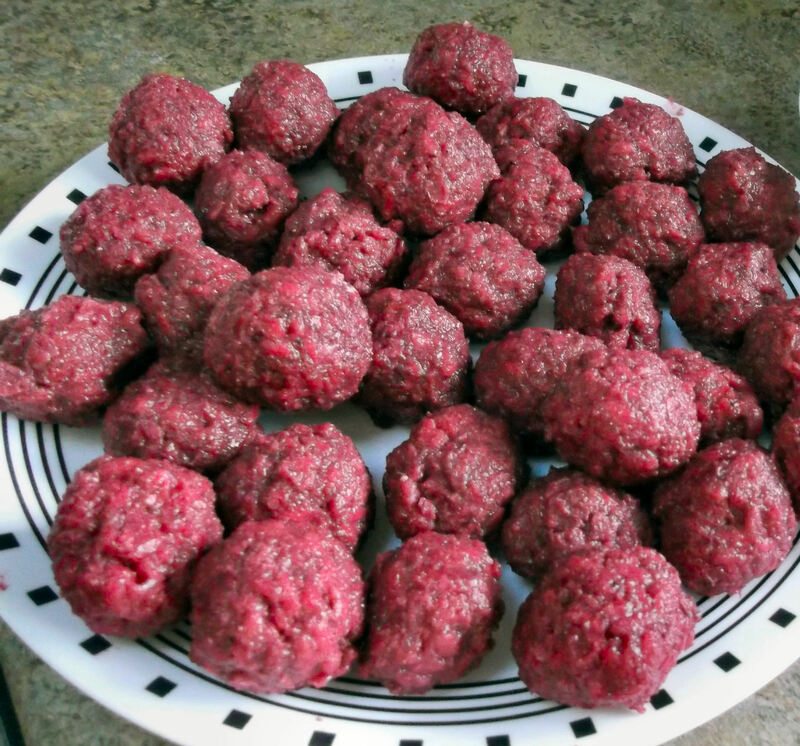 Form all the balls and set aside, or refrigerate until later. Gently roll each ball in the flour, shaking off excess, then add it to the eggs to coat, shaking off excess, and then place it the panko, coating it completely. 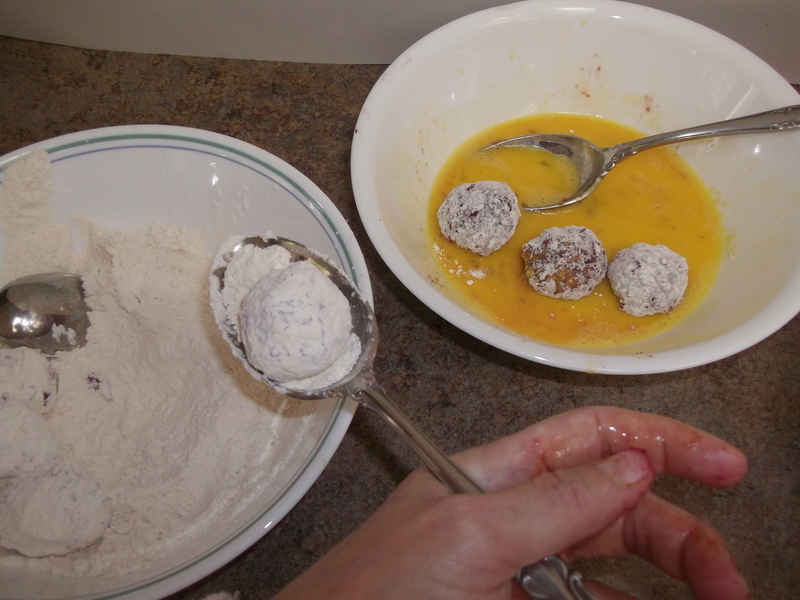 To minimize messy fingers, use a slotted spoon to move the balls from the flour to the eggs, use one hand to coat the balls with egg and move to the panko, and the other hand to coat with panko and remove). 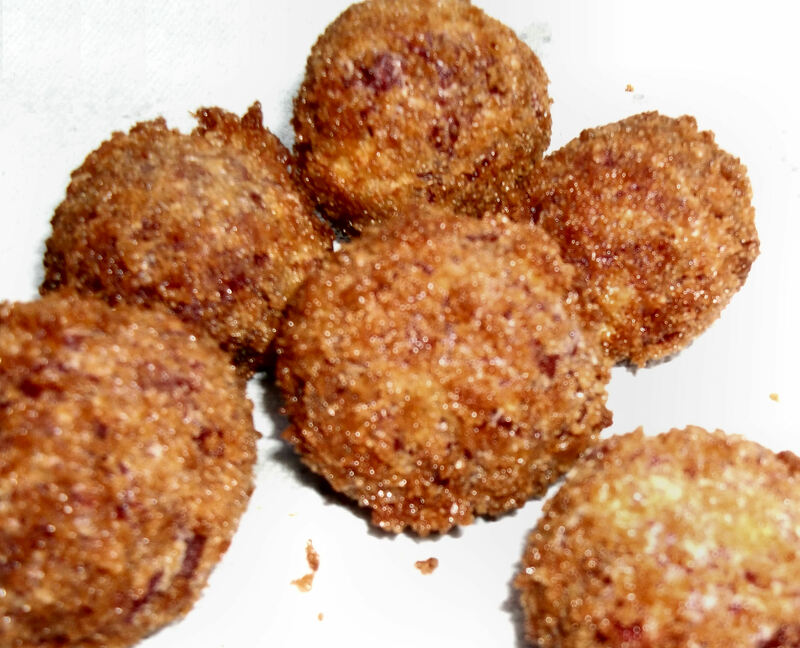 Set panko-coated balls aside and continue until all are coated. 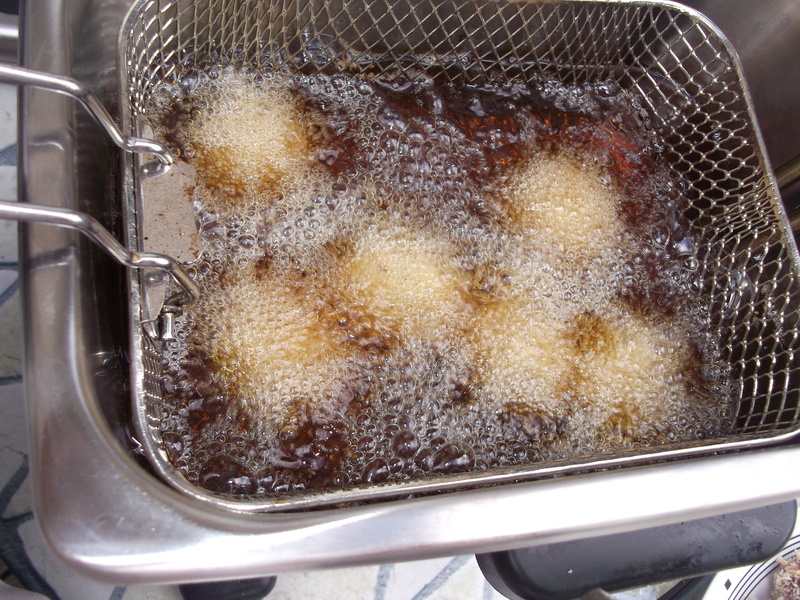 Heat oil to 350 F to 375 F, either in a deep fryer or in saucepan. Add a few arancini at a time, leaving plenty of space between them, and keep turning the arancini until golden brown on all sides, about 2-3 minutes. Transfer with a slotted spoon to a paper towel-lined sheet pan. Allow the oil to reach 350 F to 375 F again before adding more. Serve while hot with balsamic glaze (optional) or reheat in a 350 F oven to serve later. Combine balsamic vinegar and brown sugar in a saucepan. Bring to a bowl, then lower heat to low and let simmer until reduced by about half. It will have a syrupy consistency thick enough to coat a spoon. Allow to cool before using. Puree the roasted beet, adding water as needed to smooth it out. Mine was pretty chunky, but that’s fine. Using a 2” cookie cutter (or something else small and round), cut the cooled risotto into evenly shaped rounds. 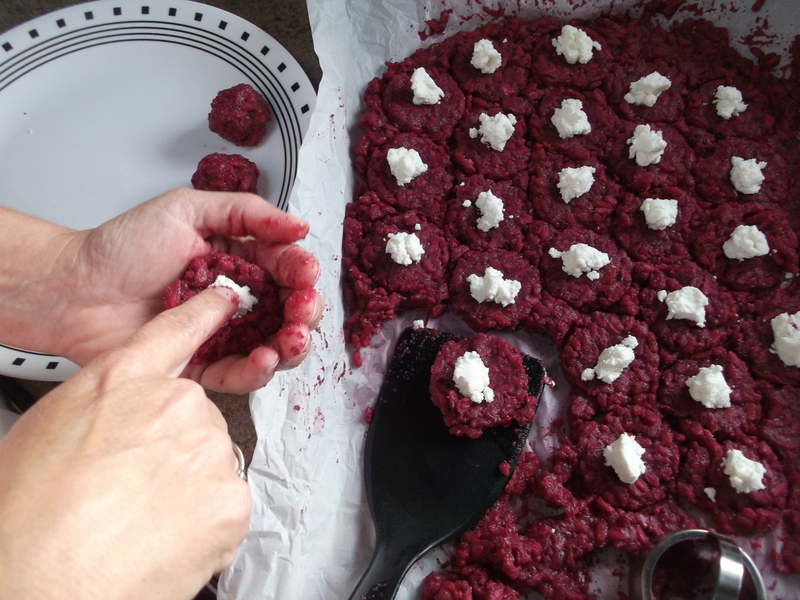 Leave them in place on the parchment and press a marble-sized (½” to ¾”) piece of goat cheese in the middle of each round. Using a spatula, carefully lift up a piece and place it in the palm of one hand. Curl that hand slightly to form a bowl and use the other hand to mold the risotto into a ball, completely enclosing the cheese. Wet hands with water if the risotto starts to stick to them. Form all the balls and set aside, or refrigerate until later. Gently roll each ball in the flour, shaking off excess, then place in the eggs. I used a slotted spoon to gently shake each ball to remove the excess flour. This is Idea #1 for keeping hands less messy. Coat each floured ball with egg, shaking off excess before placing in the panko. Note that I used my left hand for this step.This is Idea #2 for keeping hands less messy. 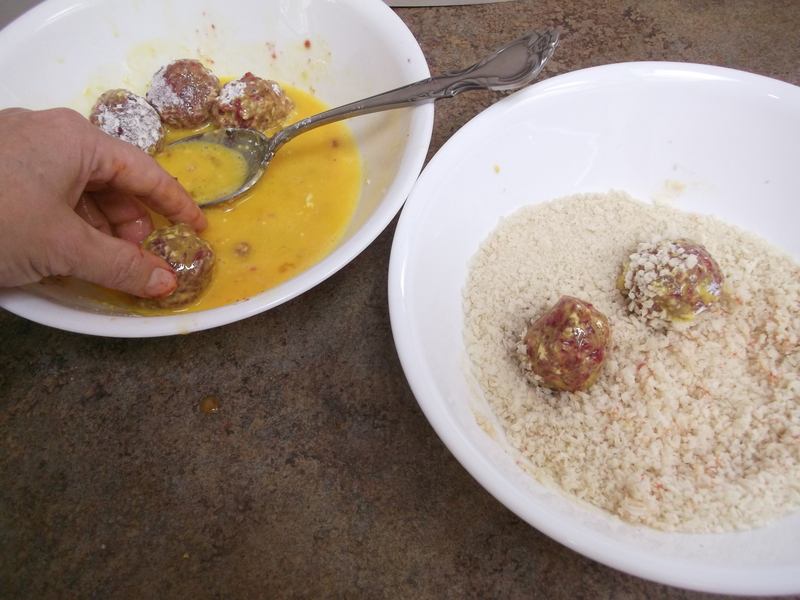 Place each egg-coated ball in the panko and toss to coat it completely and then set aside. I used my right hand for this step. This is Idea #3 for keeping hands less messy. Continue until all balls are coated. Then wash those not-as-messy-as-they-would-have-been hands, because they are still going to be a little messy. Now comes the fun! Heat oil to 350 F to 375 F, either in a deep fryer or in saucepan. Add a few arancini at a time, leaving plenty of space between them. Don’t overcrowd…let them mingle freely. Keep turning the arancini until golden brown on all sides, about 2-3 minutes. Transfer with a slotted spoon to a paper towel-lined sheet pan. Allow the oil to reach 350 F to 375 F again before adding the next batch, or they will just absorb the oil and they won’t brown nicely. These are best served hot while the cheese is still warm and melty inside. It wasn’t intentional that the half on the left looks like a heart, but I liked that it did, because I heart these so much! Serve these hot with balsamic glaze (optional). To serve later, reheat in a 350 F oven until warm. I call this glaze “optional” because I liked the arancini both with and without it, but found it a little overpowering when I used too much of it. However, I like the idea of it, and never would have thought of it if I hadn’t seen it in the recipe I consulted. Good idea for snacks! Anything that combines wine as an ingredient has got to be the ace. I look forward to trying this recipe! I may try mixing some chopped walnuts into the goat cheese, to give a little more of a “bite”. I hope you love it! I was thinking of adding nuts, too, the next time I make it. I’ll probably add chopped marcona almonds.